My first time on track (yes, ever!) was at the MV Agusta USA press launch where they let us all get acquainted with their various models. All of the bikes were quite fun, really, and the Brutale was one of my favorites. 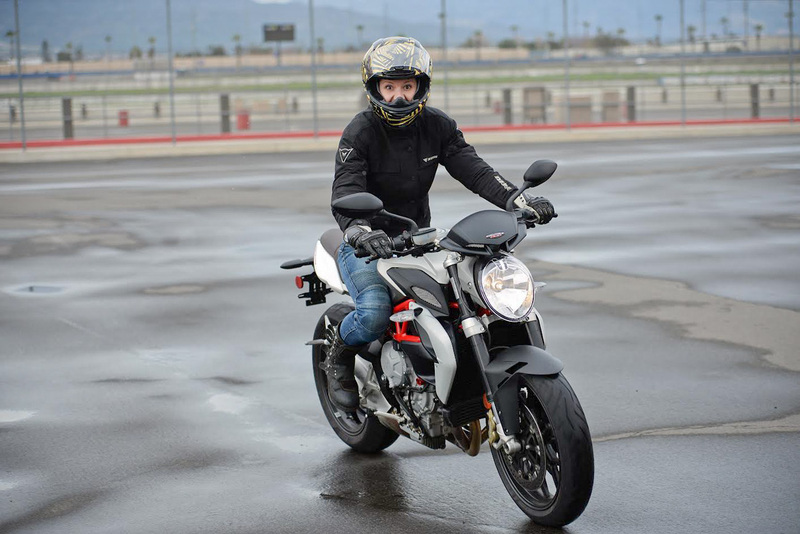 While I was completely geared up with protective UglyBROS usa jeans, a Dainese GT400 jacket, RevIt Jerez Gloves, and my trusty Elsinore boots, I didn’t have proper track apparel. That didn’t stop me from having some fun anyway. 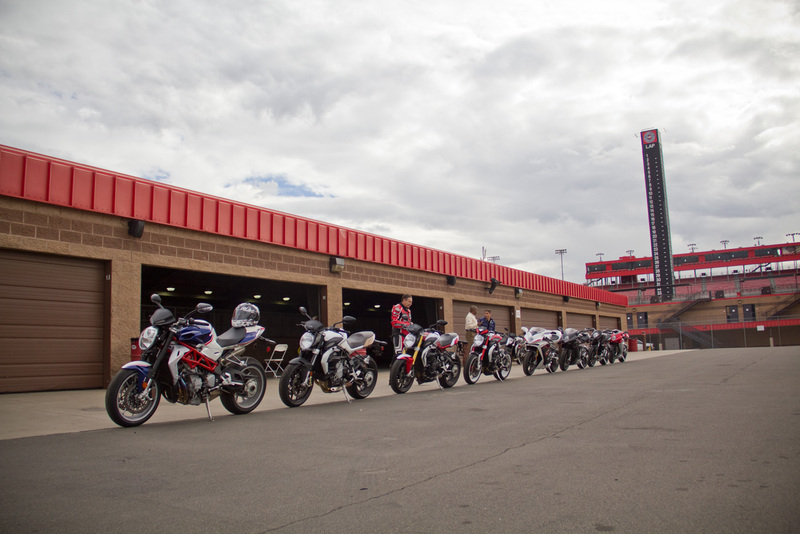 Separated into groups of four or five, we all hopped onto bikes and followed Bruce, the MV Agusta technical guru (and a track instructor) onto the track at the Auto Club Speedway in Fontana, CA. Having fun face! I’m actually smiling, but I look kind of scared. Ha! It rained a bit just before the last group (the one I was in) which sort of sucked but didn’t cause me much worry. Being from Portland I’ve done plenty of riding in the rain. After we all ate lunch we spent some more time on track in smaller groups sort of riding as we wanted. 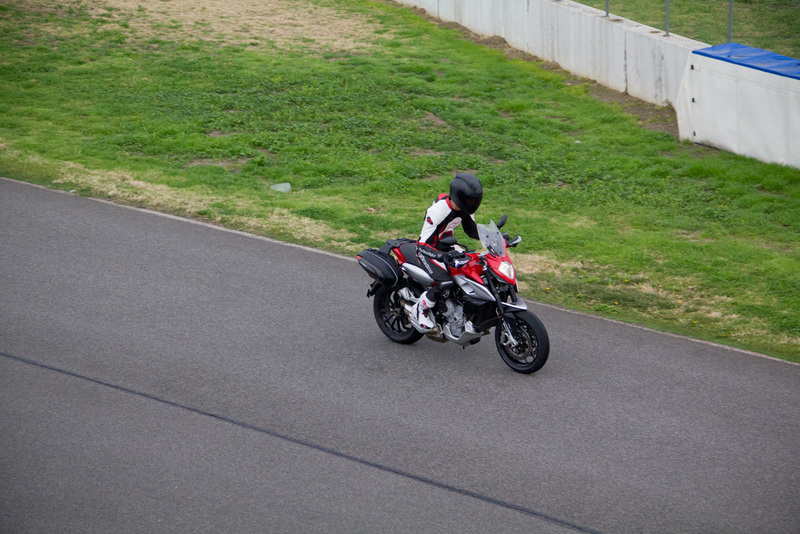 Bruce and I spent some one on one time on the track where he offered me some advice on my riding position and cornering- though he said he was impressed with my lines. Yay! What a dream come true. I had a lot of fun leaning the MVs over in the corners and giving them some serious throttle in the straights. Make sure you keep at eye on Sportbikes Inc Magazine for my article on the press event and the whole day! Above photos by Jose Gallina copyright jgallina.com, other images by Alicia Mariah Elfving copyright themotolady.com 2015. Awesome! Did you gat any pictures on the F4 or F3?